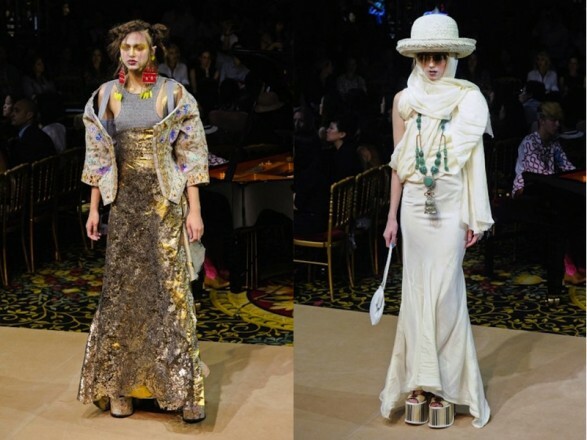 Vivienne Westwood always has a little of what has given him the win. His attitude has always been reflected in their clothing. I imagine that your new Spring-Summer 2012 is a reflection of our times. On the one hand the influence of Asian countries on the other hand the chaos in which we are immersed. The collection is inspired by China, corsets, the desert and in the construction and deconstruction of garments. The sloppiness of luxury is reflected in almost every collection in layers. Tight corsets give a romantic style of some of his creations look. Dresses impossible with cuts, lines and patterns inspired by China. The looks “gangsters” also have a place in your collection with hats xxl. The gowns and evening allowed sumptuous fabrics. The highlights of the supplements are completely impossible platform shoes.